Click here for this fantastic brown suede vest! It’s time to talk about another one of my new womens leather vest I added! 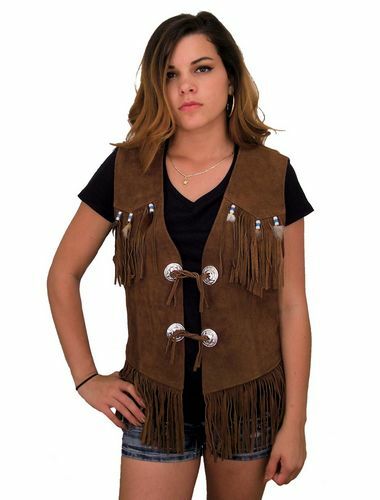 Leather Supreme has a gorgeous womens brown suede leather vest for sale that would satisfy just about anyone who likes Native American-inspired or Western apparel. It also has sort of a retro look. It’s made of a rich tobacco brown suede that’s soft against your skin, and it includes two layers of fringe on the front and back – one layer across the bodice and another around the bottom. The top layers of fringe include turquoise-colored beads and feathers. This womens brown suede leather vest has a deep plunging neckline in front, with two concho ties.